Chicken barley soup is delicious, beneficial for health and beauty. 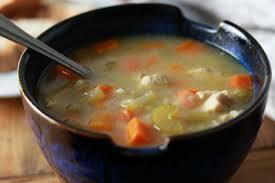 Chicken with barley soup increase benefits for health. It provides numerous benefits. It is a great dish for breakfast. It consists of fiber and many essential minerals. Barely is very useful for weight loss.It consists of amino acids they provide help to reduce weight. Barley is beneficial for blood pressure control, it consists of Phosphorus helps in forming bone. It also helps to lower the bad cholesterol and lowers the activity of HMG-CoA reductase enzyme and helps lower blood cholesterol levels. 1. First, soak the barely in two cups of water for one hour. 2. Now take seven cups of water in a heavy bottomed pan and add the bay leaf, peppercorn, carrot, onion, celery, and chicken to it. Bring it to a boil and lower the heat. 3. Continue to simmer on medium heat and remove the scum from time to time. Cook for thirty to thirty-five minute on medium heat. 4. Strain the stock and set it aside. Now debone the chicken leg and chop the meat.Discard the vegetables. 5. Drain the water from the soaked barley. 6. Melt the butter in a nonstick pan on low heat, add the barley and cook approximately 5 minutes. 7. Add the reserved stock and continue cooking approximately half an hour. 8. Now add the salt and white pepper powder. 9. Now add the chicken to barely mixture and simmer for another 4 to 5 minutes. 10. Add the cornflour dissolved in half cup of water, cook for a minute and remove from heat.Add the parsley and stir. 11. Now the time to server piping hot garnished with cubes of cucumber.